Whoa!! So, I almost forgot to get this posted and since I created it with the PDCC120 colors, I better get it up. ;) I used the newest release from Peachy Keen Stamps on my card. 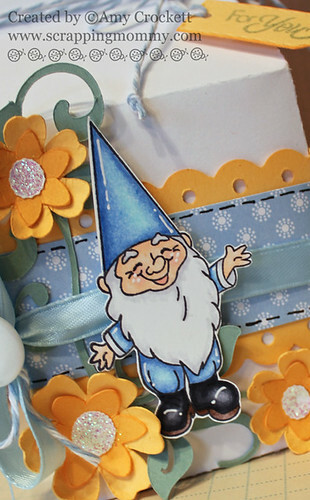 This adorable little gnome is in the Gnomegrown stamp set. I colored him in with my Copic markers and added some fun white pen details. The milk carton is cut with my Cricut Expression and the new Tags Bags Boxes and More 2 cartridge. I really do love all the fun images on this new cartridge. I even used the new scoring blade and housing and it worked out perfectly for folding the box. The flowers on my box are cut from the Flower Shoppe cartridge and I added a little bling to the centers with some glitter glue. I added some pen stitching and tied the top closed with some of the new Shore colored bakers twine from The Twinery. The stamped sentiment and die cut tag are from Teeny Tag Greetings at My Creative Time. I am LONG overdue for a giveaway, so I have one planned......check back soon!! Thanks for stopping by and leaving such sweet comments!! This is adorable, Amy! I love all of the dimension, and it's such a great color combination! Still think this is ADORABLE Amy!!! LOVE the colors you used and all the little touches you added!!! It's PERFECT!!! This is the cutest thing I've seen all day, and I LOVE the way you've wrapped everything up with that gorgeous, little bow and lots of twine! But I'm completely curious. What's in the box ;)? Thanks so much for playing along with us this week at The Play Date Cafe! This is so incredibly cute!! I love those colors!! I can't believe you used that cart!! I want it so bad!! This is so cute, so pretty, so fun and so amazing all at the same time! I LOVE this adorable box! The gnome and flowers wonderful! Amy ~ This is just CUTE but yet BEAUTIFUL! The colors are just AMAZING together! Your coloring is ABSOLUTELY perfect! Oh I really thought I didn't need that cartridge and the score thing but you my sweet friend have just convinced me other wise! You have now made it on my list secret list of "ENABLERS"! Lol Fabulous project! Wow, this is fabulous! I am so excited, I just got this cartridge. 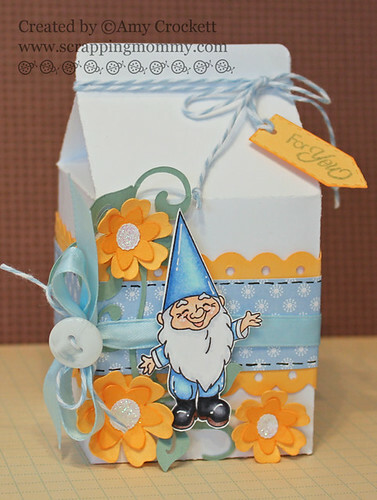 I love the milk carton and can't wait to make one! I must get this cart.....loveeeeee the Milk Carton! :) TFS! Love these colors together! I really need to follow the Play Date Cafe challenges - it looks like great inspiration! I also love that SU! designer paper (got it in my stash!) Wonderful project overall! TFS!